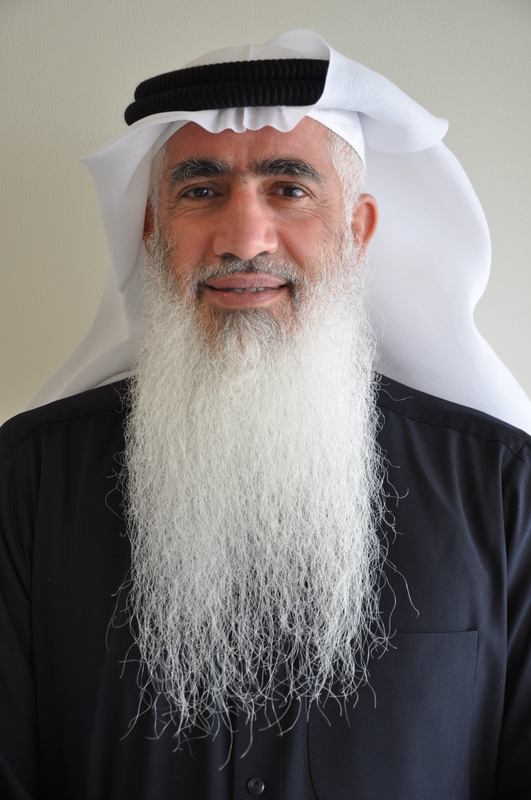 Hani Mansour M. Al-Mazeedi (born 1954) is a Kuwaiti scientist who specializes in Halal requirements, quality and Safety systems for food (HACCP/Pre-requiste programs such as GMP & GHP) and Halal services for the Halal Industry. He is the son of Mansour Mosa Al-Mazeedi, one of the founding members of the National Assembly of Kuwait. Dr. Hani through Kuwait government (Ministry of Awqaf and Islamic Affairs and Kuwait Institute for Scientific Research) and GSO (Gulf Standard Organization) of the GCC Cooperation Council for the Arab States of the Gulf has organized the first gulf conference on the Halal Industry and its Services from 24–26 January 2011, and many have attended the conference as it was the first of its kind in the region of Arabia and other Arab countries of the Persian Gulf. This conference has received great success exceeded all expectations as witnesses by the attendances. Born in America – 1971 . Lives in Jerusalem – Palestine. Masters degree at Al-Quds university (specialization in Fiqh legislation and its fundamentals in Islamic religion ) . Excellent average in courses. Master thesis title : “Additives in food and beverages :an Islamic Shari’a perspective “. 1998: Bachelor degree in Dawa And Fundamentals of Islamic Religion – Excellent evaluation – Al-Quds University. 2003: Diploma in methods of teaching in general and Islamic methods of teaching in particular at the UNRWA Headquarters – Amman. 2004: Certificate in holy Quran recitation with honors based on narration Hafs from Assem from Palestinian Ministry of Awqaf . A founder member of the Halal team at al-Quds University in Palestine . Aspiring at have an influence on the Islamic legal, scientific and applied aspects, in relation to the idea of Halal in terms of its complementary concept. A Member of the National Team to find specifications of Halal upon a request from the Palestinian Specifications and Standards Institution. Among these specifications was to include Halal in cosmetics, which was virtually achieved. (She developed the idiosyncratic perception for these specifications). Activist in clarifying the concept of Halal and defining it in various ways possible. She aims at getting the achieved results to be instilled with its complementary concept not only in our Islamic and Arabic society, but in the Western world where many Moslems live, and for Halal to be applied in their realities. She looks forward to attracting people’s attention to the concept of Halal in their lives and to continue her academic education to obtain the Doctoral degree in Islamic Jurisprudence and legislation, a topic complementary to her Master thesis. Worked as a teacher of Islamic Religion for 12 years. Contributed as an administrative member to one of the charity institutions. Dr. Hani Al Mazeedi has organized the first gulf conference in 2011 in Kuwait dedicated in particulate to the halal Industry and its services. Dr. Hani has also organized a Halal Workshop on March, 27-28, 2012, in Kuwait, with the title: Towards the establishment of a fund to finance Halal R&D activities. Consuming and utilizing Halal products and its services to society are religious obligations on all Muslims. As a true follower of Islam it is our duty to consume only the food, pharmaceutical, nutrients, and cosmetic products which are Halal and Tayyib. Bulk of the food, pharmaceuticals and cosmetics are imported by Muslim markets from producers and manufacturers which have very little appreciation of the concept of Halal and Tayyib therefore it our collective responsibility to ensure due care is taken at every step to verify that products are fully Halal compliant. To fulfill these requirements, there is an urgent need to develop and co-ordinate manufacturing, quality assurance of Halal products and above all an authentic Halal certification. Halal product manufacturers need to maintain and guarantee the integrity of their Halal chains. A uniform Halal standard or certification across the globe could reassure Muslim communities and provide the food that would comply with the guidelines of Quran and Sunnah. Presently, products available in the market with Halal labels are not necessarily authentic or at least questionable which are marketed to entice Muslim consumers. Despite well explained Halal standards provided by the importing countries, many of the exporting countries or manufacturers and producers do not strictly follow the protocols. Halal regulatory bodies often do not consider the steps required for Halal production, for example animals are not slaughtered according to accepted Halal requirements therefore use of any material derived from these animals for secondary products. Based on all this information, it is very urgent for Muslim communities to make a set of guide lines for Halal industries and services. As a follow up to the First Gulf Conference on Halal industry and its services that was held in Kuwait on 24-26th January, 2011 and the International Halal R&D Workshop held in Kuwait on 27-28th March 2012, this Second Gulf Conference on Halal industry and its services aims to establish a platform for International Accreditation of Halal Certification Bodies based in Kuwait. This initiative will not only provide business opportunities for investors and manufacturers but also restore confidence in Halal products available in the market in Muslim communities. The Halal Conference was be preceded by a training course in collaboration with Malaysia entitled: Halal Lead Auditor. 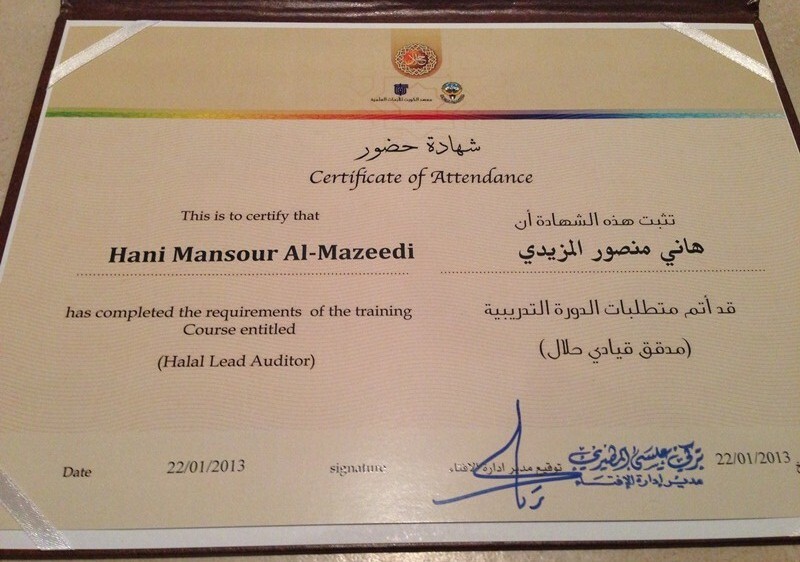 The training course was for three days, and its attendance was free of charge. Dr. Hani is also organizing the third Gulf conference, 13 – 15 May 2014, in Kuwait, with the title: Developments in the Halal Industry. A special show halal showcase will be organized in parallel (13-15 may 2014) and an intensive training course entitled Skills in Controlling Critical Points in the Halal Industry and its Services will be held the 12 may.